For the architectural material, see Glazed architectural terra-cotta. For the ceramics of Ancient Egypt and the Indus Valley, see Egyptian faience. Faience or faïence (/faɪˈɑːns/ or /feɪ-/; French: [fajɑ̃s]) is the conventional name in English for fine tin-glazed pottery on a buff earthenware body, at least when there is no more usual English name for the type concerned. The invention of a white pottery glaze suitable for painted decoration, by the addition of an oxide of tin to the slip of a lead glaze, was a major advance in the history of pottery. The invention seems to have been made in Iran or the Middle East before the ninth century. A kiln capable of producing temperatures exceeding 1,000 °C (1,830 °F) was required to achieve this result, the result of millennia of refined pottery-making traditions. The term is now used for a wide variety of pottery from several parts of the world, including many types of European painted wares, often produced as cheaper versions of porcelain styles. English generally uses various other terms for well-known sub-types of faience. Italian tin-glazed earthenware, at least the early forms, is called maiolica in English, Dutch wares are called Delftware, and their English equivalents English delftware, leaving "faience" as the normal term in English for French, German, Spanish, Portuguese wares and those of other countries not mentioned (it is also the usual French term, and fayence in German). The name faience is simply the French name for Faenza, in the Romagna near Ravenna, Italy, where a painted majolica ware on a clean, opaque pure-white ground, was produced for export as early as the fifteenth century. Technically, lead-glazed earthenware, such as the French sixteenth-century Saint-Porchaire ware, does not properly qualify as faience, but the distinction is not usually maintained. Semi-vitreous stoneware may be glazed like faience. 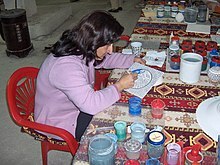 Egyptian faience is not really faience, or pottery, at all, but made of a vitreous frit, and so closer to glass. The Moors brought the technique of tin-glazed earthenware to Al-Andalus, where the art of lustreware with metallic glazes was perfected. From at least the 14th century, Málaga in Andalusia and later Valencia exported these "Hispano-Moresque wares", either directly or via the Balearic Islands to Italy and the rest of Europe. Later these industies continued under Christian lords. "Majolica" and "maiolica" are garbled versions of "Maiorica", the island of Majorca, which was a transshipping point for refined tin-glazed earthenwares shipped to Italy from the kingdom of Aragon in Spain at the close of the Middle Ages. 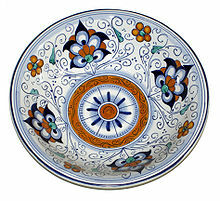 This type of Spanish pottery owed much to its Moorish inheritance. In Italy, locally produced tin-glazed earthenwares, called now called maiolica, initiated in the fourteenth century, reached a peak in the late fifteenth and early sixteenth centuries. After about 1600, these lost their appeal to elite customers, and the quality of painting declined, with geometric designs and simple shapes replacing the complicated and sophisticated scenes of the best period. Production continues to the present day in many centres, and the wares are again called "faience" in English (though usually still maiolica in Italian). At some point "faience as a term for pottery from Faenza in northern Italy was a general term used in French, and then reached English. The first northerners to imitate the tin-glazed earthenwares being imported from Italy were the Dutch. Delftware is a kind of faience, made at potteries round Delft in the Netherlands, characteristically decorated in blue on white. It began in the early sixteenth century on a relatively small scale, imitating Italian maiolica, but from around 1580 it began to imitate the highly sought-after blue and white Chinese export porcelain that was beginning to reach Europe, soon followed by Japanese export porcelain. From the later half of the century the Dutch were manufacturing and exporting very large quantities, some in its own recognisably Dutch style, as well as copying East Asian porcelain. There were also imitations of Italian istoriato maiolica, painted with figurative subjects, made in France from around 1590 onwards, especially in Lyon and Nevers. "English delftware" produced in Lambeth, London, and at other centres, from the late sixteenth century, provided apothecaries with jars for wet and dry drugs, among a wide range of wares. Large painted dishes were produced for weddings and other special occasions, with crude decoration that later appealed to collectors of English folk art. Many of the early potters in London were Flemish. By about 1600, blue-and-white wares were being produced, labelling the contents within decorative borders. The production was slowly superseded in the first half of the eighteenth century with the introduction of cheap creamware. 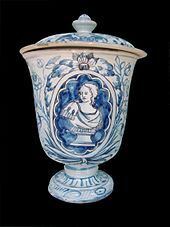 Dutch potters in northern (and Protestant) Germany established German centres of faience: the first manufactories in Germany were opened at Hanau (1661) and Heusenstamm (1662), soon moved to nearby Frankfurt-am-Main. In France, centres of faience manufacturing developed from the early eighteenth century led in 1690 by Quimper in Brittany, which today possesses an interesting museum devoted to faience, and followed by Rouen, Strasbourg and Lunéville. In Switzerland, Zunfthaus zur Meisen near Fraumünster church houses the porcelain and faience collection of the Swiss National Museum in Zurich. By the mid-18th centuries many French factories produced (as well as simpler wares) pieces that followed the Rococo styles of the French porcelain factories and often hired and trained painters with the skill to produce work of a quality that sometimes approached them. The products of French faience manufactories, rarely marked, are identified by the usual methods of ceramic connoisseurship: the character of the body, the character and palette of the glaze, and the style of decoration, faïence blanche being left in its undecorated fired white slip. Faïence parlante bears mottoes often on decorative labels or banners. Wares for apothecaries, including albarello, can bear the names of their intended contents, generally in Latin and often so abbreviated to be unrecognizable to the untutored eye. Mottoes of fellowships and associations became popular in the 18th century, leading to the Faïence patriotique that was a specialty of the years of the French Revolution. In the course of the later 18th century, cheaper porcelain, and the refined earthenwares first developed in Staffordshire pottery such as creamware took over the market for refined faience. In the early 19th century, fine stoneware—fired so hot that the unglazed body vitrifies—closed the last of the traditional makers' ateliers even for beer steins. At the low end of the market, local manufactories continued to supply regional markets with coarse and simple wares, and many local varieties have continued to be made in versions of the old styles as a form of folk art, and today for tourists. 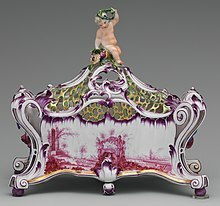 In the 19th century Minton revived tin-glazed pottery in the style of Renaissance Italian maiolica and at the Great Exhibition of 1851 exhibited earthenware pottery with colored translucent glazes over low relief decoration. These so-called majolica wares were later also made by Wedgwood and numerous smaller Staffordshire potteries round Burslem and Stoke-on-Trent. At the end of the nineteenth century, William de Morgan re-discovered the technique of lustered faience "to an extraordinarily high standard". Egyptian pendant of lions or Apis Bull. The Walters Art Museum. The term faience broadly encompassed finely glazed ceramic beads, figures and other small objects found in Egypt as early as 4000 BC, as well as in the Ancient Near East, the Indus Valley Civilisation and Europe. However, this material is not pottery at all, containing no clay, but a vitreous frit, either self-glazing or glazed. The Metropolitan Museum of Art displays a piece known as "William the Faience Hippopotamus" from Meir, Egypt, dated to the Twelfth Dynasty of Egypt, c. 1981–1885 BC. Examples of ancient faience are also found in Minoan Crete, which was likely influenced by Egyptian culture. Faience material, for instance, has been recovered from the Knossos archaeological site. Many centres of traditional manufacture are recognized, as well as some individual ateliers. A partial list follows. Creamware and other types of refined earthenware Staffordshire pottery developed in the 18th century were hugely successful and exported to Europe and the Americas. 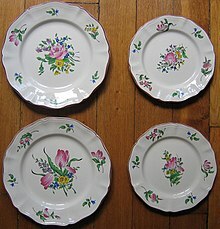 These are not called "faience" in English, but may be in other languages, eg creamware was known as faience fine in France. ^ Alan Caiger-Smith, 1973. Tin-Glazed Pottery (London: Faber and Faber). ^ "Apis Bull". The Walters Art Museum. (Royal Pharmaceutical Society) "English Delftware Storage Jars"
"Tin-glazed earthenware from Port Royal, Jamaica" Archaeology reveals English, Russian and Dutch wares. 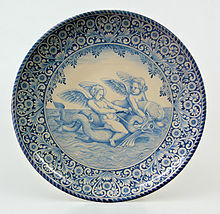 Wikimedia Commons has media related to Faience. "Faience" . Encyclopædia Britannica. 10 (11th ed.). 1911. p. 126.